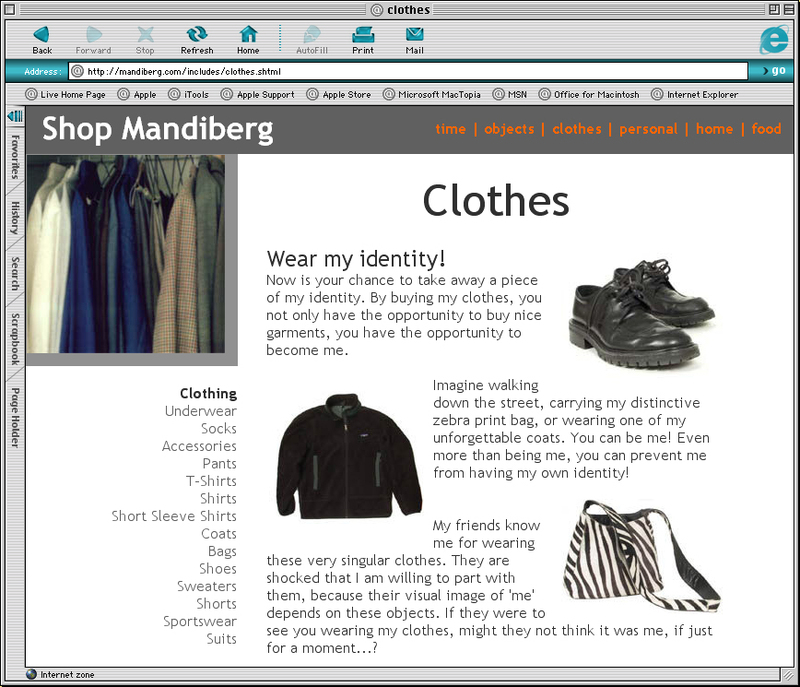 On January 1, 2001, I launched Shop Mandiberg, a fully functional ecommerce website and yearlong performance in which I marketed and sold all my possessions, including the food in my refrigerator, my clothing, and my passport. Everything was for sale, from my underwear to my favorite coats, my apartment keys to a mostly used jar of strawberry jam. By selling the objects that constituted my unique consumer identity, I sought to disintegrate myself: to literally “sell out.” Shop Mandiberg closed on December 31st, 2001. Within a month of its launch, the project was written about widely by The New York Times, the Chicago Tribune, and Berliner Zeitung, among others; it has also been written about in Flash Art and included in Joline Blais and Jon Ippolito's At the Edge of Art (Thames and Hudson, 2006) and Rachel Greene's Internet Art (Thames and Hudson, 2003). Shop Mandiberg has been exhibited at the New Museum of Contemporary Art, New York; the Zentrum für Kunst und Medientechnologie (ZKM) and SudWestRundfunk (SWR), Karlsruhe; Transmediale Media Art Festival, Berlin; and Moving Image Gallery, New York.